Joseph Holloway spent the last evening of 1916 wandering around Dublin, celebrating the end of a momentous year in Ireland, when he came across a poster for Ireland a Nation (US: Macnamara, 1914). “For a week or more,” the architect and theatre buff observed, “I’ve been reading on the hoardings on a large 15 feet by 9 feet poster bordered with shamrocks – with large ones at angles & printed on green which tells me of the finest picture film ever produced / Ireland a Nation / Nothing like it has been seen before!” (Holloway, 31 Dec. 1916: 1608). Ad for Ireland a Nation in New York and Chicago-based Motography 26 Dec. 1914: 22. When Waterford-born but New York-based scriptwriter and producer Walter Macnamara had made Ireland a Nation in 1914, the film reflected a very different political situation. Macnamara conceived a film that would trace the history of Irish struggles against British rule from the passing of the Act of Union by the Irish Parliament in 1800 to the passing of the Home Rule bill by Westminster in 1914. He had shot historical scenes – among them the Irish parliament, Robert Emmet’s 1803 rebellion and Daniel O’Connell’s duel with political rival D’Esterre – on location in Ireland and at studios in London, but the film had ended with actuality footage of crowds of Irish nationalists jubilantly welcoming what they thought was the achievement of Home Rule. The film had been shown in US cities, debuting at New York’s Forty-Fourth Street Theatre on 22 September 1914, but it had not been seen in Ireland (McElravy). The outbreak of World War I had not only caused the suspension of Home Rule, it had also delayed the Irish exhibition of Ireland a Nation. “When Dame Fortune refuses to smile upon a venture, things will somehow manage to go wrong if only out of sheer cussedness,” commented an article in the second issue of Ireland’s first film journal Irish Limelight on the sequence of events that prevented Ireland a Nation reaching the country to date. Two prints of the film sent to Ireland had been lost en route: “[I]t is understood that the first copy dispatched by [the Macnamara Co. of New York] was lost with the ill-fated Lusitania; a duplicate copy was substituted, but as this also failed to successfully run the submarine ‘blockade,’ it became necessary to forward a third” (“Between the Spools”). Masthead of the Irish Limelight, Feb. 1918. Courtesy of the National Library. A week later, however, a new poster near Holloway’s home on Haddington Road confirmed that this was, in fact, a film by providing more details of the coming exhibition. “I saw on hoarding near Baggot St end of Haddington Rd. that – ‘Ireland a Nation’ for ‘one week only’ was announced for Rotunda commencing Monday next & week,” he noted, “& I thought would we ever have it in reality – for ‘one week only’ even.” (Holloway, 5 Jan. 1917). Holloway’s melancholy reflection related to the distant possibilities for a self-governing Irish nation beyond filmic representation, but even a film of Ireland achieving nationhood would prove impossible to show in January 1917. Scene showing interruption of a hillside Mass by soldiers. Scene showing Sarah Curran roughly handled by soldiers. Scene of execution of Robert Emmet – from entry of soldiers into Emmet’s cell to lead him away. Scene of Home Rule Meeting in 1914. Irish Flag displayed at end of the performance. This constituted much of the contentious political material, including the actualities of the Home Rule meeting, but Sparling had no choice but to make the cuts. And although he was the proprietor of the suburban Bohemian Picture Theatre, he hired Dublin’s largest picture house, the city-centre Rotunda, which had a capacity of 1,500 people, a third more than the Bohemian (“Irish Film Suppressed”). Ad for Ireland a Nation; Dublin Evening Mail, 8 Jan. 1917: 2. About 100 persons were present at the opening production and the Picture was received with applause throughout, except some slight hissing, when Lord Castlereagh and Major Sirr were exhibited. The Films deals mainly with Rebel Leaders and their followers being hunted down by the Forces of the Crown and Informers, and has a tendency to revive and perpetuate, incidents of a character, which I think at the present time are most undesirable and should not be permitted. While Chief Secretary Edward O’Farrell considered Love’s suggestion that the film be banned by the authorities – and a military observer reported on the opening night to Bryan Mahon, the General Officer Commanding British forces in Ireland – Holloway went to another afternoon screening that had a far larger attendance than the sparse 100 that Love reported at the 2pm show. Indeed, because of the queue at the box office of the ground-floor “area,” Holloway ended up on the balcony. However, the film did not impress him. It reminded him of the increasing repertoire of Irish nationalist history plays by Dion Boucicault, J. W. Whitbread, and P. J. Bourke that had been staples of Dublin’s Queen’s Theatre for decades. Holloway had long been a regular at the Queen’s, but he favoured the kind of restrained acting introduced by the Abbey Theatre. The gestural melodramatic style used by Queen’s actors in the film also contrasted with evolving screen-acting practices. Nevertheless, the film uniquely preserves Irish melodramatic performance of the period. Other commentators provided more positive reviews than Holloway’s. 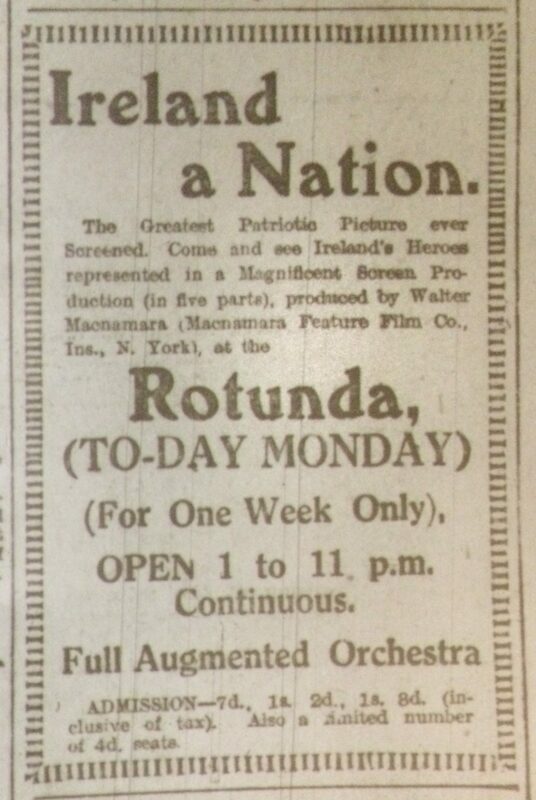 Perhaps not surprisingly for a nationalist newspaper whose slogan was “Ireland a Nation,” the reviewer in the Freeman’s Journal was enthusiastic, calling the film “[f]rom a historical standpoint, and indeed, from the standpoint of realism, […] undoubtedly excellent” and bound to “attract numerous visitors to the Rotunda during the week” (“Irish History Films”). Although not so wholeheartedly appreciative, the reviewer at the unionist Irish Times confirmed its popularity, noting that “[t]he film, which treated the rebel cause with sympathy, and the music, which included a number of Irish patriotic tunes, were received with loud and frequent applause by the audiences” (“Rotunda Pictures”). 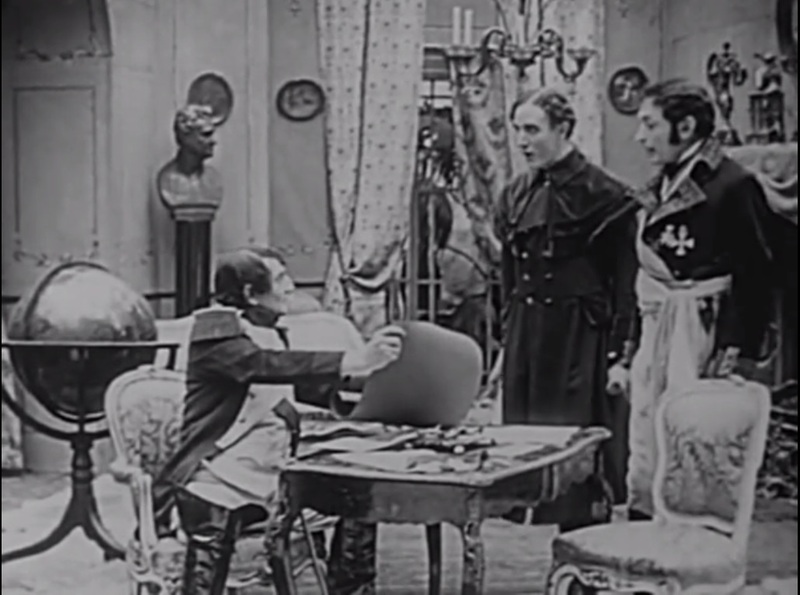 Framegrab from Ireland a Nation, in which Irish revolutionary Robert Emmet (Barry O’Brien) is astonished by the help Napoleon agrees to send for an uprising in Ireland. I rarely saw anything like the crowds that stormed the Rotunda about eight oclock seeking admission. I am sure several thousands were wedged up against the building […]. The night was piercingly cold but the patient waiters kept themselves warm and in good humour by cheering all who left the building & made room for others behind. On the other side of the streets around the Rotunda crowds of people stood looking at the dense black masses clinging on to the walls of the Rotunda like barnacles to the bottom of a ship. When these later audiences got inside, they were more rowdy than those earlier in the day had been. Love reported that “the Picture was received with applause throughout, except some slight hissing, when Lord Castlereagh and Major Sirr were exhibited” and Holloway that the Irish airs played by the augmented orchestra “were taken up by the audience & sung.” As the evening wore on, audience behaviour grew more explicitly political. “At the last performance of the film on Monday night,” the Bioscope reported, “a large section of the audience sang the song, ‘A Nation Once Again’” (“Irish Film Suppressed”). The military observer advised Bryan Mahon that “the film in question was likely to cause disaffection, owing to the cheering of the crowd at portions of the Film, the hissing of soldiers who appeared in the Film and the cries made by the audience” (CSORP). As a result, Mahon decided to ban the screenings, but on finding that Sparling had sought and got permission from the military censor, he agreed to try cutting the film further and observe how the Tuesday night screening would be received. “The result of the reports of Tuesday night were more adverse than those of Monday night,” O’Farrell noted, “and in consequence Sir B. Mahon issued an order prohibiting the performance of the Film throughout Ireland, which was served on Mr. Sparling at about 1 o/c on Wed. Afternoon” (CSORP). The reports received from witnesses, of the affect produced on the audience at the display of the above Film last night, the 9th inst., and the seditious and disloyal conduct apparently caused thereby, make it clear that the further exhibition of the Film in Ireland is likely to cause disaffection to His Majesty, and to prejudice the recruiting of His Majesty’s forces. I therefore forbid any further exhibition of the said Film in Ireland, and hereby warn you that any further such exhibition will be dealt with under the Defence of the Realm Consolidated Regulations, 1914. Despite the authorities’ efforts to cover over all traces of the film, it continued to be discussed in the following weeks and years. Indeed, Ireland a Nation was and is one of the most significant films of the 1910s in Ireland. In part, this was because its title made it a particular attraction for nationalists at this historical moment, as Holloway suggested, but there are other reasons. Its fascination for nationalists in the aftermath of the Rising made it also of interest to the police and military, who rarely gave much attention to films. As a result, the nature and extent of the surviving sources on the film – particularly Holloway’s diary entries and the official police and military documents – are unusually varied and comprehensive. They allows us to say something about individual screenings of the film in Dublin on 8 January 1917, especially in relation to audience response, which is often the least documented element of an individual film showing. Ireland a Nation also appeared in Ireland at a significant moment in the press engagement with cinema. The Freeman’s Journal, one of the country’s main daily papers, published an editorial on cinema on 6 January, the Saturday before the film opened. This was not, however, focused on the film, but on the fact that since cinema had taken the place of live theatre, it was “imperative that we should consider how the new theatre can be made subservient to the public utility” (“Cinema”). 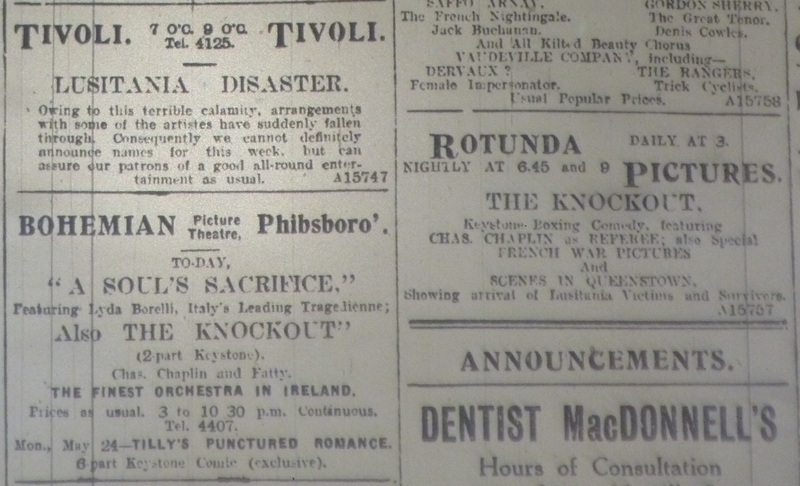 Nevertheless, with the excitement caused by the release of Ireland a Nation and then its prohibition, cinema had unprecedented visibility on the editorial and news pages of Dublin’s and Ireland’s newspapers well into mid-January. As was the case for most of the articles in the Limelight, no author was named for the historical inaccuracies piece, which was instead attributed to a “Student of Irish History” who had sent in a letter in the wake of the banning. Although this correspondent detailed the film’s historical mistakes, s/he nonetheless considered them “too patently ridiculous to call for serious criticisms.” Not that s/he thought the film irredeemably bad, arguing that “the theme was treated by both producer and players with every sympathy and respect, and with a clear eye to propagandism as well as simple picture setting.” Such errors as showing revolutionary priest Fr John Murphy reacting to the 1800 Act of Union when he had been executed in 1798 would have been obvious to any contemporary Irish person with an interest in history. Having pointed out such anachronisms, the writer accounted for them as arising from “a desire to get in prominent figures in the Ireland of the period and weave them into a complete story without any regard for chronological order or historical connection” (“Irish Film Suppressed”). Erin, the figure of Ireland, inscribes Emmet’s epitaph onto his headstone in Ireland a Nation. Ireland a Nation argues that the telling of tales is a political act, and that was certainly the case in Ireland in 1917. But this was not the end of the film in Ireland or indeed in America. It was revived – indeed reinvented – first in America and then in Ireland. One of its most vivid storytelling motifs relates to Robert Emmet, who having being condemned to death, famously declared that his grave should be unmarked: “When my country takes her place among the nations of the earth,” he ordered in his famous speech from the dock, “then, and not till then, let my epitaph be written.” In the film, a woman representing Erin, the embodiment of Ireland, inscribes an epitaph onto Emmet’s gravestone because with Home Rule, Irish nationhood had seemingly been achieved. When Ireland a Nation was revived in America in 1920, this material was out of date, and Ireland had not been granted Home Rule. As a result, later newsreel footage of Sinn Féin leader Eamon De Valera’s visiting New York in 1919 to seek recognition of an independent Ireland was added as a further inscribing of the national story. Later again, newsreel of the Irish War of Independence and the funeral of republican hunger striker Terence McSwiney was included. It was only with the establishment of the Irish Free State in 1922 that this film – an incomplete version of which still survives – could be shown in Ireland. The political situation had again changed dramatically in the aftermath of the debates on the Anglo-Irish Treaty by the Dáil (Irish parliament). At least part of Ireland was in some way independent, and one of Dublin’s largest cinemas celebrated by giving an uninterrupted run of Ireland a Nation. “Between the Spools.” Irish Limelight 1:2 (Feb. 1917): 19. “The Cinema.” Freeman’s Journal 6 Jan. 1917: 4. CSORP/1919/11025. National Archives of Ireland. “The ‘Ireland a Nation’ Film: Criticisms of Historical Inaccuracies.” Irish Limelight 1:2 (Feb. 1917): 3. “Irish Film Suppressed: ‘Ireland a Nation’: Military Stop Exhibition at Dublin.” Bioscope 18 Jan. 1917. “Irish History Films: ‘Ireland a Nation’ at the Rotunda.” Freeman’s Journal 9 Jan. 1917: 3. McElravy, Robert. “‘Ireland a Nation’: Five-Reel Production Giving Irish History in Picture Form.” Moving Picture World 3 Oct. 1914: 67. “Rotunda Pictures.” Irish Times 9 Jan. 1917: 3. Arthur Balfour, “Cabinet Minister as Cinema-Lecturer,” touts the importance of war films; Bioscope 6 Jan. 1916: 16. The Trade has just cause for pride and gratification in the complete unanimity with which Press and public, Cabinet Minister and man-in-the-street alike, have welcomed the official cinematograph pictures of the war and the life and training of our soldiers and sailors. It has, we admit, taken a very long time to convince the Government and the Fourth Estate of the value of the cinematograph as the national historian, but now that their approval is forthcoming and the work pronounced to be good, we can well afford to regard the time as well spent. (“Nation’s Historian.”). Doubtless Balfour’s endorsement of Britain Prepared was a valuable governmental recognition of the British film industry, and as such it is an important historical document. It is more doubtful that a film clearly conceived as propaganda – showing how Britain had prepared and was prepared to fight its enemies – can be considered a work of history. Nor was the Bioscope really interested in making a case for the film as history; it was enough of an achievement that Balfour’s presence and words showed how useful cinema had become to the war effort. David Lloyd George and H H Asquith feature in this ad for Metro Pictures; Dublin Evening Mail 3 Jan. 1916: 5. While Balfour argued that Britain Prepared was not mere entertainment but a film that British politicians should take seriously, one distribution company suggested that two other Cabinet ministers were watching its films for relaxation. In January 1916, the Dublin Evening Mail carried a series of ads placed by Ruffell’s, British agents for US production and distribution company Metro Pictures. The ads featured the Ruffell’s mascot, a parrot in a top hat, and in the first of these ads – which is in comic-strip form – the parrot convinces Minister for Munitions David Lloyd George and Prime Minister Herbert Henry Asquith to watch a Metro film as a needed break from their war duties. The incongruity of the images of these senior politicians visiting a cinema with the behatted and cigar-chewing parrot might distract from the no-less significant if admittedly less spectacular incongruity of this and other ads appearing in an Irish daily newspaper. Distribution was a wholesaling business; it acted as the intermediary between the manufacturers – film production companies such as Metro – and the retailers – the cinema-owners who actually showed the films. In the ordinary course of business, a distribution company such as Ruffell’s would advertise in such cinema trade journals as the Bioscope but not in the dailies. Ruffell’s did advertise in the trade press, but this series of ads sought to create recognition among cinema-goers of the relatively new Metro brand name and of the Ruffell’s parrot. Official war film British Army in France at the Provincial Cinematograph Company’s Dublin picture houses. In the fist half of this week, the Grafton had shown With the Indian Troops in France. Dublin Evening Mail, 20 Jan. 1916: 5. And the parrot was right: cinema was more likely the nation’s – or the world’s – entertainer than its historian. Amusement was the primary reason that Irish patrons visited a picture house, even if they did also come for other reasons, including to see how the war that they mostly read about in newspapers actually looked, and to cheer or to boo at a film that sought to use such images to engender patriotic feelings towards a nation that was invariably Britain. Nonetheless, the notion of the cinema as national historian had particular resonances for Ireland in 1916, as it has in 2016 as the country commemorates 1916. The experience of the more than 200,000 thousand Irishmen in the British armed forces were, of course, represented to some extent by Britain Prepared and other propaganda films that were appearing in increasing numbers. The Picture Houses in Grafton Street and in Sackville/O’Connell Street, which were owned by the British chain Provincial Cinematograph Theatres, made a particular feature of these films, promoting them with prominent illustrated ads, such as the one for British Army in France on 20 January. The Bioscope quoted Balfour as regretting that Britain did not “have a permanent record of the grand deeds of our armies in France and Flanders” (“Britain’s Might Revealed”). A number of such films did exist, but filmmakers would answer this call for a permanent record most spectacularly later in the year in the form of the film The Battle of the Somme (Britain: British Topical Committee for War Films, 1916). As one of the main purposes of such films was to show the unity of the kingdom, they could not represent the motives of Irish nationalists, who had to look elsewhere for elements of an Irish historical experience on film. This was clearly so in the case of the separatist nationalists who sought Irish independence from Britain and opposed recruitment, but it also included the many more moderate Irish nationalists, even soldiers who had joined the war in answer to John Redmond’s call to fight for Home Rule. Nationalist MPs at Westminster ensured Ireland was treated as a special case even in relation to military recruitment, a fact emphasized in January 1916 when the Military Service Act excluded the country from the compulsory conscription. Given the paucity of film production in Ireland, there was little prospect of cinema providing a detailed film record of the struggle for Irish national self-determination. The nearest thing to such a film was Ireland a Nation (US: Macnamara, 1914), shot in Ireland in 1914 but not shown in the country until 1917. Newsreel films of armed National and Irish Volunteers parading do exist, albeit that the Ulster Volunteers were better at media management, including arranging for cinematograph operators to record significant demonstrations. Fiction films representing Ireland’s rebellions in 1798 and 1803 had been made by US companies such as Domino and Kalem, Sidney Olcott shooting many Irish-shot films for the latter. The special Sunday shows at Dublin’s Phibsboro Picture House on 23 January featured For the Wearing of the Green (US: Domino, 1914), in which “Paddy Dwyer, the Irish blacksmith, and his helper, Dennis Grady, who is also his daughter Norah’s sweetheart, are the prime leaders in the conspiracy against the Crown” (“Domino”). The Hibernian Electric Theatre’s Sunday feature a week later was Olcott’s The Mayor from Ireland (US: Kalem, 1911), in which two Irish immigrants follow each other in the office of New York mayor. Neither of these films was a new release, but their revival suggests their importance for Irish audiences in offering fictional self-representations that included revolutionary romances. Ad for Hibernian, Evening Telegraph 29 Jan. 1916: 1. Indeed, the Hibernian Electric Theatre may provide one of the most direct links between Irish cinema and the revolution that was being planned for 1916. This picture house at 113 Capel Street, Dublin, had previously been called the Irish Cinema and had been owned and run by Richard Graham. Financial difficulties including rent default forced Graham to sell in late 1915 (“Capel Street Picture House”). No account of the reopening as the Hibernian appears to exist, but it was advertising in the Evening Telegraph by the start of January. The ads and short notices that month give an indication of some of the people involved, including manger Thomas Fullam and musical director Miss M. Grundy (“Hibernian Electric Theatre”). It is possible that it was owned or part owned by Michael Mallin, as later recalled by his son (Hughes 76-78.). Dublin silk weaver, British Army bugler, union organizer and leader of the Irish Citizen Army, Mallin would be executed in May 1916 for his role in the Easter Rising. How his picture-house experience may have had a bearing on his revolutionary activity or vice versa is difficult to say. Nevertheless, the Hibernian was located beside the Trades Hall – a fact noted in ads – and it is likely that its programming aimed to attract union members, as well as the many working class people who lived in the slum districts that would have been the catchment area for the cinema’s audience. In 1913 and 1914, the Irish Cinema had been the only picture house and one of the few entertainments of any kind that advertised in the radical labour journal The Irish Worker. However, apart from The Mayor from Ireland, its offerings seem little different from those of other Dublin picture houses. Irish Independent 4 Jan. 1916: 4. If Irish picture-house owners – even radical ones – had only moulded cinema in limited ways to produce a national moving image, religious groups were working more deliberately to ensure that cinema reflected the churches’ worldview. This was particularly the case with Catholic groups, such as the Dublin Vigilance Committee, which in December 1915 had coalesced with other vigilance groups around the country to become the Irish Vigilance Association (IVA). Following his arrest on 31 December 1915, serial cinema protester and militant IVA member William Larkin was released from Dublin’s Mountjoy Jail on 4 January 1916. He had been imprisoned for non-payment of the fine imposed on him in October and November for his protest at the Bohemian Picture Theatre in September (“Picture Theatre Protest”). The IVA arranged a parade of welcome from Larkin’s house in Sherrard Avenue in the north city to Foster Place, a favoured place to hold speeches beside the city-centre building that had until 1800 had been the Irish parliament. Larkin’s short prison term had done nothing to lessen his activism on the introduction of film censorship; indeed, it allowed him to claim a certain martyrdom. “I was treated as a low criminal in Mountjoy Jail for protesting against a film,” he claimed in an exchange of correspondence published by the Evening Telegraph. “I had to don a convict’s garb, eat skilly, lie on a board, and refuse hard bread. I had to parade with degenerates in a prison yard; and all, that our youth might be spared gazing on suggestion” (“Proposed Cinema Censorship”). In the Dublin township of Rathmines, the ongoing controversy on the opening of picture houses on Sunday continued into early 1916. At a meeting on 5 January, the council eventually split 8-8, and the chairman cast the deciding vote in favour of closing cinemas on Sundays; they had had limited opening hours before this. Councillor Thomas Kennedy spoke in favour of keeping them open, reading a supporting letter from the Ratepayers’ Protection Association that argued that soldiers’ relatives particularly liked seeing war reports and that closing cinemas on the only day when many people could visit them would drive these people to the pubs for recreation. Rejecting such arguments, Chairman Sibthorpe explained that he had cast his vote in favour of Sunday closing because oculists had “stated that their work had been more than doubled since these cinemas had been applying a violent stimulant to the eyes of the young people, and they were absolutely ruining the sight of the rising generation” (“Cinema Shows”). Young people who got into trouble with the law – and their legal representatives – were well aware of these discourses on cinema’s pernicious effects on the young and of how to use them to their advantage. When “two young fellows” named Richard Barnes and Thomas Farrell appeared before Mr. Swifte at Dublin’s Southern Police Court on 27 January 1916, their solicitor argued that they had entered a banana store illegally because of watching burglaries at the picture houses and playing slot machines (“Cinema and Slot Machines”). These new forms of popular culture “were the means of leading many a young fellow astray,” he argued. Chaplin foils a robbery in Charlie at the Bank (US: Essanay, 1915). The person responsible for a good amount of this violent visual stimulation in Ireland in 1916 was Charlie Chaplin, but in January 1916, he was foiling robberies rather than committing them. The writer of the Evening Telegraph’s “Gleaned from All Sources” column, however, had picked up the news that Chaplin’s career was on the wane, “which is the obvious and inevitable result of overdoing the Chaplin ‘boom.’ When it came to imitations in music-hall revues and Charlie Chaplin calendars and pin-cushions,” s/he observed, “a reaction was inevitable.” Despite merchandizing and overexposure, that reaction was not apparent in Dublin picture houses, according to the review writer in the same issue of the Telegraph. Charlie at the Bank had recently been released, and the reviewer was assessing the show at the Pillar Picture House. “There is more riotous fun packed into this two-reel comedy than any other photo-play of a like length. The world’s great comedian, Charlie Chaplin, has outdone himself in this new production. While all his other comedies are funny, this one is a scream. It abounds in real humour and comic situations, with Chaplin at his best in his inimitable antics” (“Pillar Picture House,” 18 Jan.). Charlie at the Bank was shown at more picture houses than any other film that month, suggesting that cinema-owners did not believe that Chaplin’s career was experiencing a dip. Audiences seemed to agree: on account of the “hundreds who could not gain admission” during the three day run, the film was held over for a further three days (“Pillar Picture House,” 20 Jan.). As 1916 began, Irish audiences enjoyed a thriving cinema culture that more often offered them a violent stimulant of the Chaplin kind than national history. “Britain’s Might Revealed by Film: A Cabinet Minister as Cinema-Lecturer.” Bioscope 6 Jan. 1916: 16A. “Children at the Cinema.” Evening Telegraph 8 Jan. 1916. “Cinema and Slot Machines.” Dublin Evening Mail 27 Jan. 1916: 5. “Cinema Shows: Sunday Performances in Rathmines: Action of Urban Council.” Evening Telegraph 5 Jan. 1916: 5. “Domino: The Wearing of the Green.” Moving Picture World 3 Mar. 1914: 1302. “Dublin and District: Picture Theatre Protest.” Irish Independent 1 Jan. 1916: 6. “Gleaned from All Sources: The Late Charlie Chaplin.” Evening Telegraph 18 Jan. 1916: 1. “Hibernian Electric Theatre.” Evening Telegraph 29 Jan. 1916: . Hughes, Brian. Micheal Mallin. Dublin: O’Brien Press, 2012. “The Nation’s Historian: Triumphant Vindication of the Cinematograph.” Bioscope 20 Jan. 1916: 229. “Pillar Picture House.” Evening Telegraph 18 Jan 1916: 5; 20 Jan 1916: 5. “Proposed Cinema Censorship.” Evening Telegraph 11 Jan. 1916: 3. By May 1915, cinema had become so compulsive for some Irish people that it landed them in trouble with the law. Dublin newspapers reported on “the lure of the picture house” that had led two children, Annie Hughes and Rose Kavanagh, from Newtown Park Avenue in Stillorgan, to beg door-to-door to get money to go to the cinema (“Lure of the Picture House”). At the Police Court in Kingstown (now Dún Laoghaire), Kavanagh’s father said that his daughter acted without his knowledge and that “it was the attractions of the picture houses that cause them to beg” (ibid.). Hearing from the police that the girls were constantly begging, Justice Michael Macinerney put them on probation for 12 months. 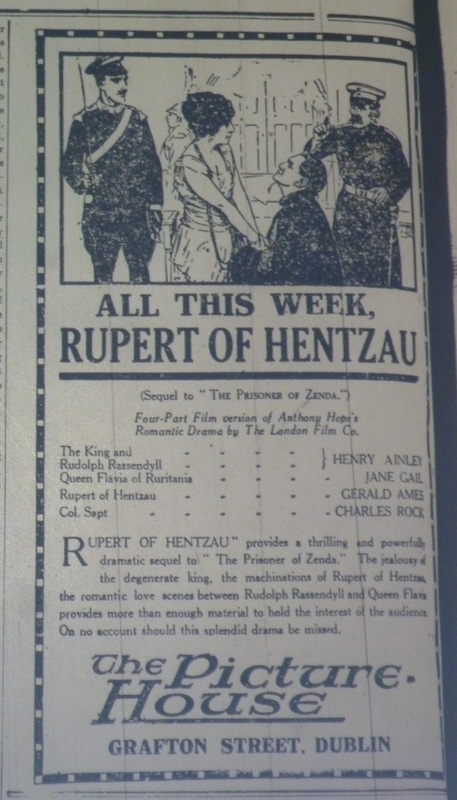 Illustrated ad for Rupert of Henzau (Britain: London, 1915) at Dublin’s Picture House, Grafton Street; Evening Telegraph 31 May 1915: 2. [A]ll the things predicted of the cinematograph are undoubtedly realisable, but, unfortunately, most of the brightest anticipations have not been achieved. The cinema was, above all, to be educational. All the drudgery of teaching was to vanish. Schools and colleges were to be transformed into theatres of instruction; the daily paper was to be supplanted by the Cinema News Bureau, and the French irregular verbs were to be assimilated in the guise of light comedy. (Paddy, 20 May). Nevertheless, “ in spite of its defects and disappointments, we must gladly acknowledge that the marvel of cinema is the vehicle of diurnal delight all over the civilised globe” (ibid). Although Irish cinema of the period was certainly a vehicle for diurnal delight, May 1915 was striking for the motivations other than delight that lured patrons to the picture houses. If diurnal delight was epitomized by Charlie Chaplin’s comedies, their power of attraction was at least matched by war films. The Cinema News Bureau had not – and would never – replace the newspaper, but the sinking of the RMS Lusitania showed how the media worked together to serve wider ideological war needs. The Cunard Line’s transatlantic steamer was torpedoed by a German submarine off Kinsale, Co. Cork, at about 2pm on 7 May, and initial reports appeared in the evening newspapers (“Lusitania”), with fuller accounts dominating the news on 8 May. The story had several aspects of interest to Irish papers, some of which had particularly local resonance and other of which linked to war-related issues. Rescue efforts were coordinated from the Cork port of Queenstown (now Cobh), where survivors and victims were initially brought and the inquest held. The large loss of civilian lives – almost 1,200 of the nearly 2,000 people on board died – world have made this a particularly important story in any case, and one that justified propagandistic condemnation of German disregard for civilian life and the rules of war. As well as this, the fact that more than 100 Americans were among the victims provided an impetus for discussion of the hoped-for US entry into the war on the British side. On Monday, Gaumont released a 350-foot “special topical,” while Pathé initially included just a 50-foot (approx. 1 minute) item in their regular Pathé Gazette, with the intention of supplementing this with a further 150-foot item for the weekend. “The enterprise of these two firms is only surpassed by their restraint,” commented the Bioscope, “when it is remembered that about ten cameras were employed, and the output of film ran into four figures” (ibid.). Entertainment ads showing impact of Lusitania sinking; Evening Telegraph 10 May 1915: 1. Irish audiences also had the opportunity to see these films. Patrons of Dublin’s Rotunda were offered “a series of pictures depicting incidents connected with the arrival of the Lusitania victims and survivors at Queenstown” (“Rotunda Pictures,” 11 May). The depth of emotion expressed by the journalist who visited the Picture House in Sackville/O’Connell Street suggests that s/he saw the longer Gaumont film. “A picture showing scenes and incidents after the sinking of the Lusitania was shown at this House yesterday;” s/he reported. What seems incongruous – but may only seem so – is that the writer so affected by the Lusitania film should find immediate relief in the comedies that accompanied it on the same programme. “After viewing those harrowing incidents,” s/he observed, “the excellent comedies came as a most welcome change; they included ‘Love and Dough,’ featuring the well-known screen comedian Ford Sterling” (“O’Connell Street Picture House”). Images of war and physical comedy complemented each other on the picture-house screen, and as will be seen below, Chaplin had become the comedian in highest demand. Although for audiences in the early 21st century such changes of tone may seem strange or even inappropriate, for audiences in the 1910s, used to entertainments that included variety and contrast, this appears to have been perfectly acceptable. In any case, films of various kinds provided the imaginative means for coming to terms with the tragedy of war, as well as the spectacle of such new technologies as the zeppelin, the torpedo and the submarine. Bearing echoes of the Lusitania sinking, for example, Dublin’s Masterpiece placed a special ad in the Evening Telegraph at the end of May advising the public that it would give its final exhibition of The Italian Navy “in which is shown a torpedo at its deadly work of sinking a passing vessel” (“The Masterpiece,” 29 May). The Lusitania sinking also had consequences for Irish cinema that only became clear much later. 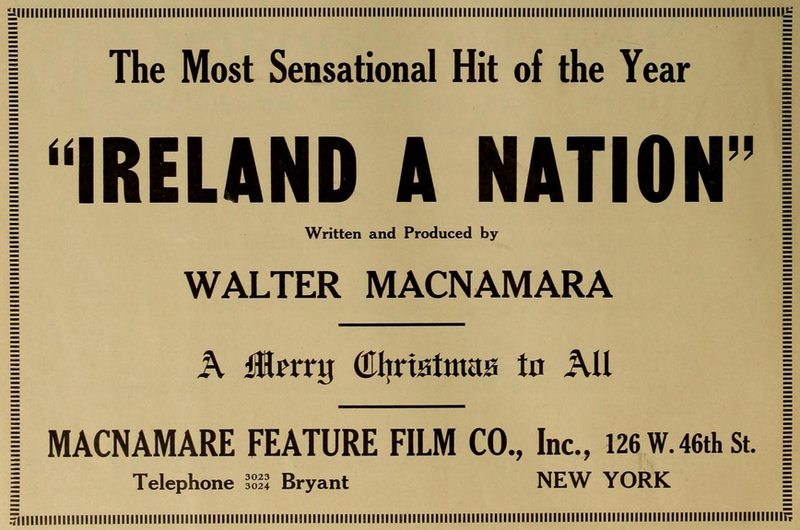 Although Walter Macnamara had shot the Irish historical drama Ireland a Nation for his New York-based production company partly in Ireland in 1914, a copy of the film did not reach the country until 1917 because “the first copy dispatched by them was lost with the ill-fated Lusitania; a duplicate copy was substituted, but […] this also failed to successfully run the submarine ‘blockade’” (“Between the Spools”). 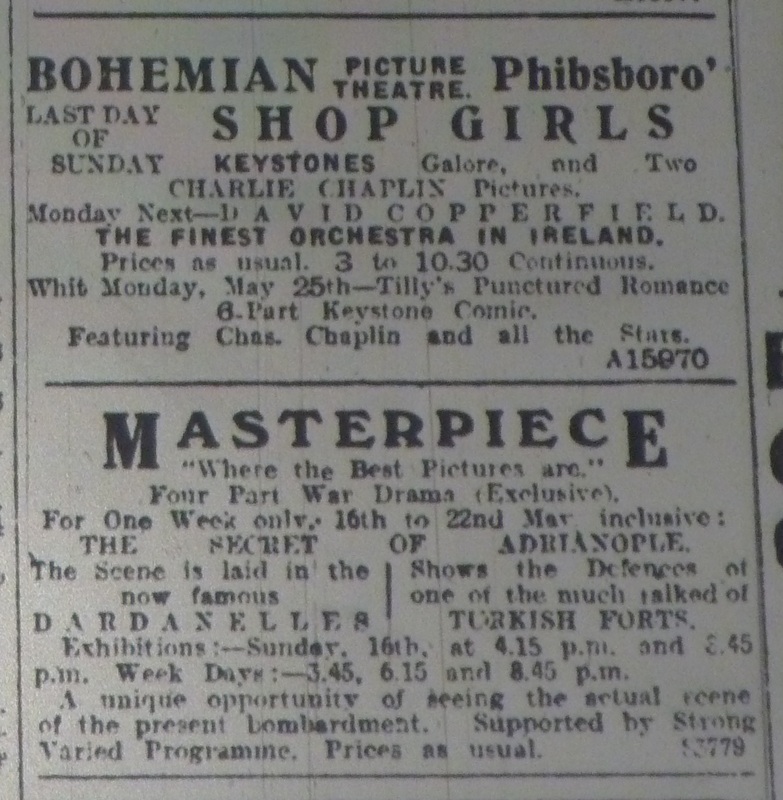 Ad for Dublin’s Masterpiece showing The Secret of Adrianople (Denmark: Kinografen, 1913) and Bohemian ad drawing attention to the big Whit Monday attraction, Tillie’s Punctured Romance (US: Keystone, 1914); Evening Telegraph 15 May 1915: 1. Although these war films clearly attracted audiences, by early summer 1915 Charlie Chaplin was Irish cinema’s most consistent draw. As already mentioned, the Rotunda showed the Lusitania newsreel beginning on Monday, 10 May; however, the “principal attraction for the great majority of the audience who will frequent the Rotunda this week will, undoubtedly, be the Keystone comedy film entitled ‘The Knockout’” (“Rotunda Pictures,” 11 May). The Knockout (US: Keystone, 1914) actually starred Roscoe “Fatty” Arbuckle and Minta Durfee, with Chaplin in a minor role, but the review of the Rotunda shows mentioned only that it featured “the well-known comedian, Charles Chaplin, as referee in a boxing match of a decidedly novel description” (ibid.). This favouring of Chaplin was consistent with a recent comment that no cinema “programme now is complete without the well-known comedian, Charles Chaplin” (“Rotunda Pictures,” 8 May). 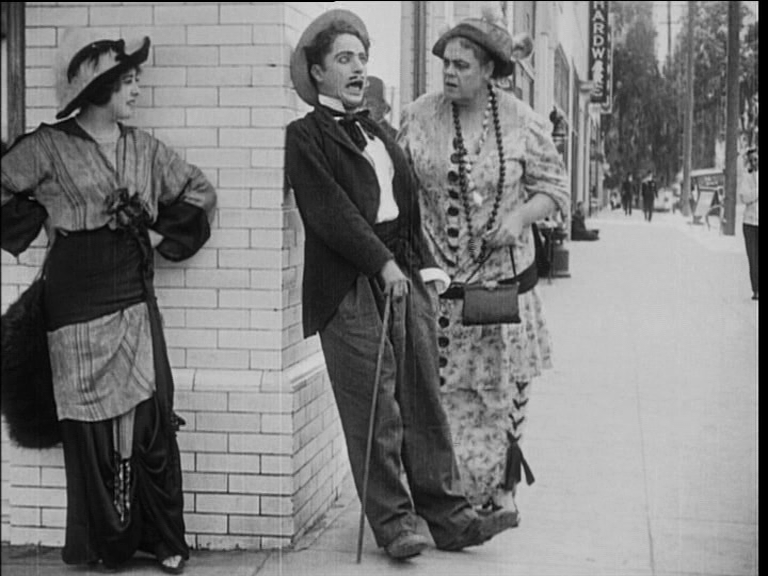 Charlie Chaplin, caught between Mabel Normand and Marie Dressler in Tillie’s Punctured Romance (US: Keystone, 1914). For the week beginning with the Whit Monday holiday, 24 May 1915, the Rotunda again featured a Chaplin film, Charlie’s New Job (US: Keystone, 1914), but the Bohemian upstaged them by securing exclusive rights to Tillie’s Punctured Romance (US: Keystone, 1914). The first feature-length comedy, the six-reel Tillie’s Punctured Romance starred Chaplin alongside stage actress Marie Dressler and Keystone favourite Mabel Normand. Reporting on a press showing of the film on 9 May, a writer in the Evening Telegraph observed that the “farcical element throughout the whole performance has full sway, and the spirit of fun dominates the various scenes. […] The film has been secured by the ‘Bohemian’ at the cost of £100, and the enterprise of the management should meet with a huge measure of public appreciation” (“Bohemian Picture House”). Their enterprise apparently was rewarded because the reviewer of the Whit Monday show commented that “Chaplin is certainly at his best in this production, and all those desirous of seeing him should go early, as the demand for seats last evening was very great” (“The Bohemian”). Such diurnal delights would continue to lure audiences for many years to come. The Bohemian.” Evening Telegraph 25 May 1915: 2. “Bohemian Picture House.” Evening Telegraph 10 May 1915: 2. “The Kinsale Verdict.” Evening Telegraph 11 May 1915: 2. “Filming ‘Lusitania’ Incident.” Bioscope 13 May 1915: 623. ‘“Lord Kitchener in France.”’ Evening Telegraph 12 May 1915: 4. “The Lure of the Picture House.” Evening Telegraph 3 May 1915: 6. “Lusitania: Sinking Off Cork Coast: Help from Queenstown: 1,400 Passengers on Board.” Evening Telegraph 7 May 1915: 3. “The Masterpiece.” Evening Telegraph 15 May 1915: 8; 29 May 1915: 8. The O’Connell Street Picture House.” Evening Telegraph 11 May 1915: 2. Paddy. “Picture in Ireland.” Bioscope 20 May 1915: 773. “Rotunda Pictures.” Evening Telegraph 8 May 1915: 8; 11 May 1915: 2.